The Vampire Lestat is at it again, prowling the streets for interesting crime mongers and this time he picked mob boss Roger. Soon after Roger's demise, he started haunting Lestat and requested that the vampire look after his daughter Dora, a TV Evangelist. At the same time Lestat feels that someone or something is﻿ following him. Soon enough, his stalker introduced himself: The Devil, Satan, Lucifer or Memnoch, a former Arcangel who fell from God's graces after he mated with a human woman and eventually became the human race's champion. Memnoch then takes Lestat in a little trip and let him witness his version of events. This is the 5th novel in Anne Rice's Vampire Chronicles. It is the author's and my favorite amongst all the Chronicles. Needless to say that this was very provocative, controversial and some devout catholics might even deem it blasphemous. If you're familiar with Anne Rice and her atheist days, most of her old works were written during the dark days of her soul and Memonoch the Devil is part of her numerous obras including The Mayfair Witches. I feel like I've stepped into Anne Rice's spiritual journal and read her doubts about the Catholic faith. 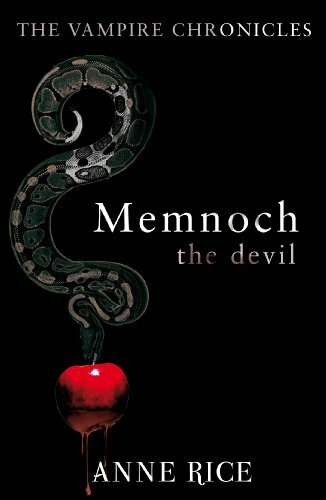 Memnoch is Lucifer and as per this tale he is Man's champion. He fell not because he was jealous of Man but because he loved Man and our ability to love and be passionate. He challenged, opposed and ultimately angered God that he was banished from Heaven. Rice sort of presented the idea of the Divine as someone who is manipulative. An omnipotent being who want his creation to follow him through fear and awe by performing miracles and preaching. Memnoch wanted Man to discover and experience God's love through his creation, in our own way, and not because an organized religion said so. It also presented the idea of fate versus free will. He even alleged that Judas Escariot became a vampire! I've been raised by Catholic nuns and priests and religion has been a centripetal force in my growth and development and this book made me curious, scared and blasphemous. It drew me to ask questions and step away from beliefs that I've abided by in so long because Anne Rice asked some of the questions that I actually thought of but was too sissy to say out loud. In the end Lestat found out that Memnoch and God were sort of in cohorts and manipulated him. They used him and his connection to Dora to influence people because at the end of the day these two factions are still at war over our souls. What's even more provocative is the idea of Hell and Satan, it's something to scare us and choose God because Heaven forbid, who would want to suffer for eternity right? And that Memnoch's goal is to steer everyone from being damned so that he can go home and take his place next to his fellow angels. I urge you to pick up this series and you can stop at Memnoch the Devil. There is a reason why most vampire lovers call and hail Anne Rice as the Queen of Vampires and that is because her stories transcend the pages of the books. Lestat and friends are one of those characters whose stories are so spectacular and personalities so big they end up lingering in your minds long after you've put down the book. The Vampire Chronicles is one of the best Vampire Series ever written and the fact that these stories are still evolving it only proves that soon enough, the Chronicles will be joining the ranks of Stoker and Shelley. Another series I am yet to start. I have always heard of this series and I know Anne Rice is talented (duh, she is Anne Rice LOL) Still I have to start this soon, iy sounds amazing. Great review hon, thank you for the recommendation. Vampire Chronicles made me want to join a coven. This was my "Barrons" and "Brotherhood" back then. And if we must join the consensus, joining a widespread backlash flash t shirt beats bandwagon jumping every time. It restores our faith in the notion that, as a society, we can abandon bad ideas. We can stop decorating our homes with lead paint. "The transmission disturbance caused lights to flicker throughout much of our service area, and several facilities, including LaGuardia Airport, Rikers Island, and some area hospitals, reported that their electrical systems switched to backup generation during the event. They were back on Con Edison power late last night. Service thanksgiving shirts on the subway system's 7 line in Queens was also impacted for about 30 minutes while track equipment was reset.